The North Platte River is a major tributary of the Platte River and is approximately 716 miles (1,152 km) long, counting its many curves. In a straight line, it travels about 550 miles (890 km), along its course through the U.S. states of Colorado, Wyoming, and Nebraska. The trail route along the North Platte River was first written about by Wilson Price Hunt of the Astor Expedition who was traveling back to the Missouri River from the newly established Fort Astoria on the Columbia River in 1811. The lack of American trappers and settlers in the contested Oregon Territory resulted in this early discovery being unused and nearly forgotten. Jedediah Smith and several trappers in 1823 rediscovered the route and the trail along the Platte, North Platte and Sweetwater Rivers became a major trail to the fur trader’s summer time Rocky Mountain Rendezvous. Mule trains carrying in trading supplies for the mountain men and fur trappers were some of the first to use the trail in 1824. The fur traders on their return trip carried the traded furs back east at the end of the summer trading season. This fur trade route continued to be used to about 1840. By about 1832 the trail along the Platte, North Platte, and Sweetwater Rivers had been improved by the fur traders to a rough wagon trail from the Missouri River to the Green River in Wyoming where most of the Rocky Mountain Rendezvous occurred. Following the fur traders, the major emigration trails established along the north and south banks of the North Platte River were the Oregon (1843–1869), California (1843–1869), Mormon (1847–1869) and the Bozeman (1863–68) Trails. The trails north of the North Platte River originally crossed the North Platte near Fort Laramie to join the original Oregon and California Trail Route on the south side. In 1850 Child's Route (Child's Cutoff)  extended the north side trail to what is now Casper, Wyoming. The rugged territory from Fort Laramie, Wyoming to Casper meant that the trails often deviated from the river to find an easier path and relied on streams draining into the North Platte for water. In Jackson county the North Platte is joined by several other small streams draining the mountains around the county. Some of these creeks are: Arapaho Creek, Colorado Creek, East Branch Illinois River, Jack Creek, Jewell Lake Trib., Grizzly Creek, Little Grizzly Creek, Norris Creek, North Fork of North Platte River, Rock Creek (Little Willow Ck), South Fork Canadian River, South Fork Michigan River, Willow Creek and in Wyoming the Encampment River. All these streams are draining the snow melt form the mountains surrounding Jackson County. 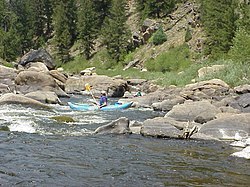 The North Platte River flows northward from Colorado into Wyoming through the popular rafting site – Northgate Canyon  which is along the western side of the Medicine Bow Mountains. The river has been dammed several times to form several reservoirs along its course. On the north end of the Park range it is joined by the Medicine Bow River in the Seminoe Reservoir formed by Seminoe Dam, further downstream is the Kortes Reservoir. Still further downstream about 50 miles (80 km) above Casper the North Platte is joined by the Sweetwater River to form the Pathfinder Reservoir. Northeast of the Pathfinder Reservoir it passes through the Alcova  and Gray Reef  reservoirs before it hits Casper. Casper was established about 1860 east of the former site of Fort Caspar, which was built about 1859 during the mass migration along the Oregon, California, Mormon and Bozeman trails. Near what is now Casper was the location of several ferries that offered passage across the North Platte River during the summer "Trail season" starting about 1847. In 1847, during the first Mormon emigration, Brigham Young leading the Mormon settlers to Salt Lake City, Utah established a ferry near present-day Casper known as the Mormon Ferry. The next year the ferry was moved a few miles down river. Soon competing ferries were built. In 1859, Louis Guinard built a toll bridge across the North Platte and a trading post near the original ferry's locations. Before reaching Casper the river turns and flows northeast between the Granite Mountains to the west and the Laramie Mountains to the east. The North Platte emerges from the mountains near Casper, where it turns and flows east-southeast, along the northern edge of the Laramie Mountains onto the Great Plains. The North Platte flows east-southeast across the plains of eastern Wyoming, past the town of Douglas, Wyoming and through Glendo and Guernsey Reservoirs. It then flows past the Fort Laramie National Historic Site (the former site of Fort Laramie), where it is joined by the Laramie River. The North Platte is joined by Horse Creek flowing in from Wyoming near the Wyoming-Nebraska border as its last significant addition. It crosses into western Nebraska, flowing east-southeast between the cities of Scottsbluff, Nebraska and Gering, Nebraska. In Keith County, Nebraska, the Kingsley Dam forms Lake C.W. McConaughy, the largest reservoir in Nebraska and a significant irrigation and recreation facility for the region. Kingsley Dam, constructed in 1935 to 1941, is located on the east side of Lake McConaughy in central Keith County, Nebraska, and is the second largest hydraulic fill dam in the world. East of the Kingsley dam the North Platte River flows nearly parallel to the South Platte River. In many places they are separated by only about 5 mi (8 km) for a stretch of about 50 mi (80 km) before they join to form the Platte River just east of the city of North Platte, Nebraska.